Quick overview This accessible handbook focuses on a description and analysis of the theoretical input as well as the approach involved in critical reflection. How can professionals learn more easily from their own experience? How can critical reflection be performed in a structured way? How can professionals maintain a critically reflective stance when contexts may be restrictive? Critical reflection in professional practice is popular across many different professions as a way of ensuring ongoing scrutiny and improved practice skills. This accessible handbook focuses on a description and analysis of the theoretical input as well as the approach involved in critical reflection. It also demonstrates some skills, strategies and tools which might be used to practise it. The cross-disciplinary approach taken by the authors will appeal to a wide range of students and professionals and combines neatly with useful discussion of the complex educational and professional issues which arise from the practice of critical reflection. An innovative website containing a variety of useful resources accompanies the book. Resources include: extracts from workshops, interviews and lectures; additional articles and readings; sample material for workshop preparation. Throughout the book, the authors provide pertinent examples from their own practice, referring to relevant literature, providing annotated bibliographies, and noting where additional resource materials are available to provide further illustration. 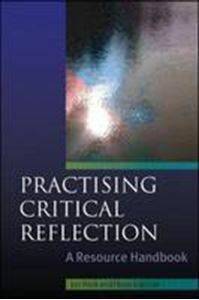 Practising Critical Reflection is key reading for a variety of students across social work, health sciences and nursing, as well as health care and social welfare professionals.